At the airport, take the shuttle bus to the train station. Take a train to Rovereto. Just outside the Rovereto train station, to the right, take the coach number 332 to Riva del Garda. Please, take a look at the timetables by: (i) opening the page timetable; (ii) clicking "Zona 3" in the left-side menu; (iii) selecting the correct coach line "332: Rovereto-Mori-Riva-Arco-Bolognano" in the left-side menu. 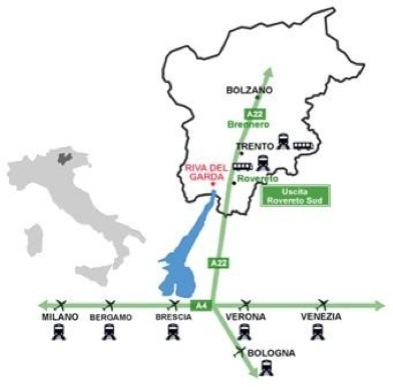 The most convenient airport is Verona (less than 1h from Rovereto), which is very well connected to Munich and Frankfurt, as well as Paris and London. You may also consider Milan, Bergamo, Brescia, Bologna and Venice, but the train trip will be longer. 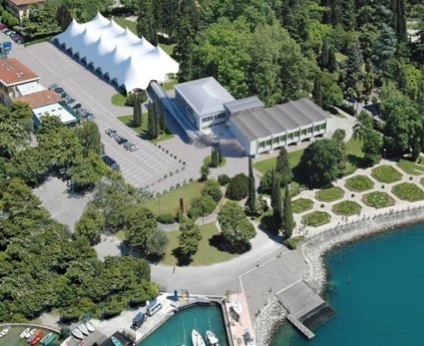 Groups (3 or more people) may consider reserving a taxi from the airport to Riva del Garda: e.g., http://taxi.limtours.it. In Milan (Malpensa) you may want to take the Malpensa Express train + metro to get to the train station. Train tickets do not need to be reserved in advance. They can be bought at the train station directly, where automatic vending machines are also available. Bus tickets must be bought at the station, before taking the bus. You may opt for a longer (around 2.5h), panoramic journey and take the coach line to Riva del Garda at the train station in Verona. Info: http://www.atv.verona.it.